More than 30% of Americans meet the criteria for obesity, as shown by recent statistics. Obesity is defined as having a body mass index (BMI) of over 30 kg/m2, and while lifestyle modification remains the first choice for treatment, bariatric surgery options are becoming more popular. 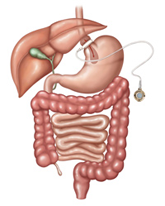 One of the surgical treatments for obesity is called gastric banding, or lap band surgery. Gastic banding is a common weight loss surgery procedure that has helped numerous men and women achieve a healthy weight in a safe, controlled manner. Dr. Bernie Hanna is one of the more experienced surgeons in Las Vegas. In order to achieve truly outstanding results, he customizes every procedure and carefully monitors each patient’s progress. Explore the paragraphs below to learn more about this weight loss option. This option for weight loss surgery is minimally invasive laparoscopic procedure that takes about 30 minutes to perform. An adjustable band is wrapped around the upper part of the stomach dividing it into a small upper pouch that holds about ½ cup of food, and a larger lower stomach. By creating a smaller stomach pouch, it limits the amount of food that one eats at any one time. This allows you to feel full sooner and stay full longer feeling satisfied. The degree of tightness affects how much food you can eat and the length of time it takes for food to leave the stomach which allows you to stay satisfied with a small amount for a longer period of time. As you eat less your body will store less calories and you will start burning fat for energy which increases the weight loss. This procedure is reversible and is the least invasive, safest procedure. Who are candidates for this option? Generally, candidates for this surgical procedure have a body mass index over 40 kg/m2, or are more than 100 pounds over their ideal body weight. It can be performed on a person with a BMI of 35-40 kg/m2 if there are other medical conditions that are weight-related, such as high blood pressure (hypertension) or diabetes. The candidate must demonstrate an understanding of the procedure, and be must make the commitment to accept significant changes in their eating habits for the rest of their lives. If you have been thinking about gastric surgery, schedule a personal consultation with Dr. Hanna. If you cannot undergo this particular procedure, you might benefit from another surgical weight loss treatment, such as gastric bypass or gastric sleeve in Las Vegas. Dr. Hanna can also help you if you have undergone weight loss surgery elsewhere and are unsatisfied with the results. Dr. Hanna can perform revision weight loss surgery to adjust the location, replace, or remove the band completely. He will explain all of your treatment options and help you choose the surgical approach that best suits your individual needs and goals. To begin your weight loss journey, contact Dr. Hanna’s Las Vegas weight loss surgery offices by calling (702) 384-1160 or by clicking here.